Dear students, Today is the first day of CPO 2018-19 Exam. It has been conducted by SSCfrom 12th March to 16th March 2019. 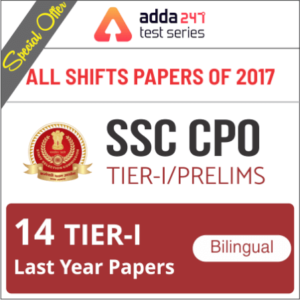 To help and guide all the remaining CPO Aspirants who are yet to appear in 2nd Shift, We are providing Exam analysis of SSC CPO Tier-1 2017 Shift-1, so that all other aspirants can get an overall and clear idea about exam pattern and difficulty level. 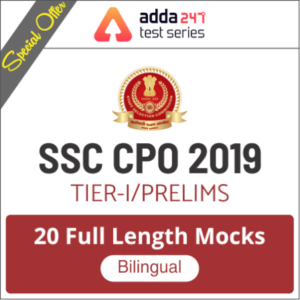 The SSC CPO Exam is being held in online mode. So dear students, without much ado, let’s get straight to the detailed Exam analysis. In SSC CPO Tier-1 Exam 2018-19, English language section was easy-moderate this year, there were 1 lengthy RC(Reading Comprehension) with 5 questions based on it. and 1 cloze test was also asked with 5 questions and questions from it were of moderate level. Vocabulary based(Antonyms/Synonyms) questions were comes from previous year. In SSC CPO Tier-1 Exam 2018-19, General Intelligence(Reasoning) questions were of Easy level, non-verbal questions were very easy. Questions from Mathematical operations were time-Consuming & very calculative. In SSC CPO Tier-1 Exam 2018-19, General Awareness questions were asked from all aspects of GA, especially from Science section, if you have basic knowledge of Science, then you can easily score good marks in GA Section. In Current Affairs, questions from awards were asked. National Women Squash 2018 Championship won by whom? Question on Microsoft Handloom Weiver? Constitutional amendment comes under which article? Which state does not share its boundary with Bangladesh?